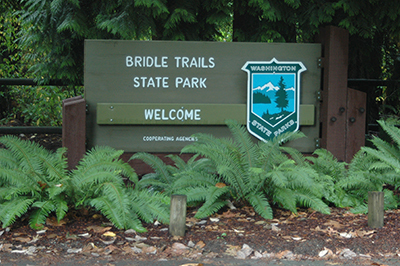 Bridle Trails State Park is located between Kirkland and Bellevue, Washington, with its main entrance in Kirkland. The park is 482 forested acres with 28 miles of equestrian/pedestrian trails.There are three marked trail loops of varying distance, from 1 to 3.5 miles long. See the trail map for details. Park facilities include horse show grounds with three arenas, bleachers, and judges stand. Showgrounds include a picnic area and restrooms. There is a large parking lot with ample, pull-through, horse-trailer parking. A Discover Pass is required to park in the parking lot. Please purchase a pass, as the revenue is critical for State Parks! The annual pass is a great deal, allowing one to park for free in any State of Washington recreational land for a year for only $30. Park hours are dawn to dusk, year-round. For safety in a park with horseback riders: No bicycles or motor vehicles allowed, and dogs must be on leash.